During World War II Liesl has to live with a forster family, not knowing why her mother had to give her up, and hoping that she will pick her up one day and take her home. During the Reichskristallnacht, where jewish stores are destroyed and books burned, she slowly understands the terror that they are living in, and the one passion that she has seems to be taken away from her: reading. But she can find a way to continue to “borrow” books. 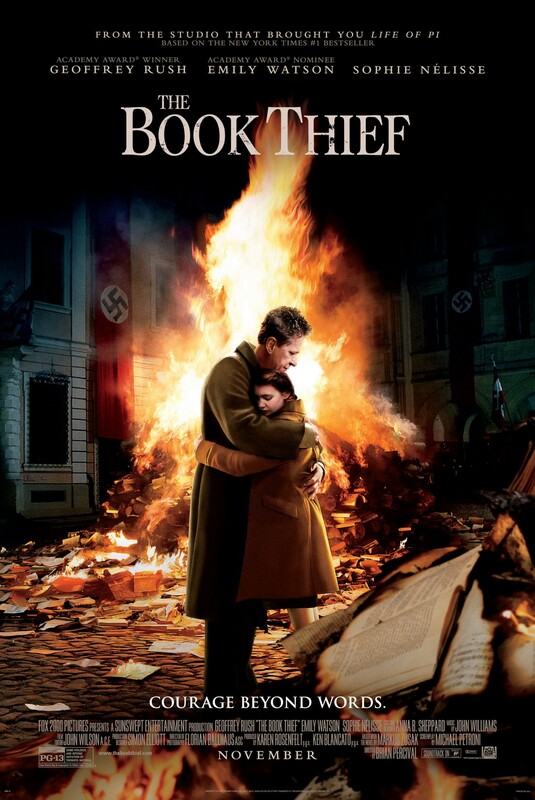 I absolutely loved The Book Thief, even though I didn’t understand who the narrator was at first. The characters are well played, Emily Wattson has the German accent down to a tee, I was very impressed. I also loved Sophie Nélisse accent which sounds polish to me. And I don’t think we have to mention what a fantastic actor Geoffrey Rush is. The movie deals with living in constant fear but still keeping hope and faith, which is very powerful. Even though it doesn’t show into detail how gruesome this time was, we get a picture, and can feel the emotions the protagonists go through. The Book Thief has a sad undertone, however, it is filled with positive energy, and I highly recommend it. I am confused why it’s only nominated for one Oscar for best music. But then again, an Oscar nomination doesn’t automatically mean a movie is brilliant or vice versa, no nomination doesn’t mean a movie is bad. I stopped believing that a long time ago. I really can’t wait to see this. I loved The Book Thief. Still have to read it. I just sent my mom the book to Germany.